A cargo ship travelling to the south east of the largest of the five islands to the south of the Gelidonya (Now called Taslik Point) that is at the farest west part of the Gulf of Antalya, collided to the rocks and started spreading her cargo and not even too later she sunked on her stern. The wreck has been discovered by a sponge diver lying in 26-28 meters depth. 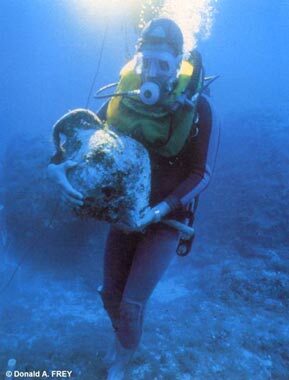 After the examination of the wreck in 1960, it was understood that the wreck belongs to the Bronze Age. Another speciality of the dives maden to the wreck, was that they were the first dives that have been made under the leadership of an archeologist diver and that they have been the first underwater archeological study that obeyed the rules of a normal archeological study. After the examination of the grass and plants that were used to put betweeen and under the cargo of the ship, they realised that the ship sunk in the later periods of 13th century before year 0. Because there was no sand or any other layer that would protect the ship's hull, the ship's hull has been eaten by sea worms especially by Teredo spec. Although they understood that the woods used to make the ship, has been bolted to each other as in the same way as the classical Greek and Roman ages. The grass and plants that have been found showed us why Odiseus used grass on his ship. The position of the cargo was first made them thaught that the ship was no longer than 10 meters but later studies show that she was larger then 10 meters. Some of the ship's cargo was used bronze that would be melt and used in making of instruments, copper and tin ingots that would be used in making of new bronze. The importance of the Gelidonya wreck is the information learned from her. In the times when the research of the wreck was continuing, it has been thaught that Mikens was holding the control of the sea trading in west mediterrennan in the late Bronze age while they were thinking the Sailors from Finike have learned their sea tarditions much later. But archeological studies on Gelidonya showed that there where some different possiblities. During the research of the wreck in 1994, the stone anchors made them think that the ship was from middle east. The artifacts salvaged from the wreck are being shown in Bodrum Underwater Archeology Museum. The birth of the underwater archeology took place in Bodrum 40 years earlier. Before this date, they also salvaged artifacts from sea and they examined the wrecks but first archeological study in a scientific style took place in Turkey. Everything started when American journalist and amateur archeologist Peter Throckmorton came to Bodrum in 1958. The wish of Throckmorton was to make an interview with the sponge divers of Bodrum. He came to Bodrum with the photographer Mustafa Kapkin from Izmir who he met for the shots and they met with the sponge diver Kemal Aras. In a short time he learned the locations of aproximately hundred wrecks from Kemal Aras and other sponge divers. One of these wrecks was a wreck loaded with copper ingots near Gelidonya, Antalya. Peter thaught that this could be a Bronze age wreck because one of the sponge divers told him that he salvaged bronze knife and some agricultural instruments from the wreck. He returned to America without diving the wreck that year. In 1959 he came back to Turkiye again and dived to the wreck in Gelidonya. He wasn't wrong, the wreck was a bronze age wreck and with her 3200 years age she was the oldest ship discovered to that date. The archeological study must be done because there could be a lot of information that would enlight the Bronze Age.But he was needing help and money. In order to find a sponsor, he returned to America. The help he founded have changed the way of the underwater researches. There was a new branch of science getting started: Underwater archeology. After a few tries, he founded the support and attention he was expecting: Pennsylvania University museum principal Rodney Young who was on a study in Gordion, decided to help him. Even he didnt only help him about money, he also send one of his most succesful student George Bass in order to lead the archeological study. In spring 1960 Throckmorton and Bass went to Turkey. The dives to the wreck that revealed she belonged to the young Bronze age, had been made between June and september 1960. They anchored on the wreck lying in 26 to 28 meters with the sponger ship Lutfu Celil. The team choosed an area for their camp site in the beach with an hour trip to the wreck site. The camp site's most important speciality was that the place had fresh water source for daily use and also for purifying salt from artifacts. Dive plans have been made, the team would dive for 40 minutes in the mornings and 28 minutes after noon. The first job of the team was to draw a detailed map of the site. After all of the area had been recorded and the artifacts had been labeled in details, artifacts have been salvaged very carefully and moved to the camp site for safekeeping and recording. If we take the findings one to one, we know that: Aproximately in 1200 before century, a merchant ship 19,20 meters long have sunked near Gelidonya. The last harbour she visited was Cyprus, were she have been loaded with 1 ton of metal load. The load was consisting of copper ignots that has been put from bow to stern. In order to hold them firmly, they had put a lot of unused ignots where possible. In the ship there was also tin ignots, lead and crystal parts that was thought that they had been loaded in a harbour after Cyprus. There was also jars that they had thought to be full of spices for trading and strangely a bracelet. All the signs showed that the crew was using only one Suriye-Filistin style lamb in the nights. We know that the crew was eating fsh and olive and they had water and wine stocks on the ship. The signet-ring and the artifacts showed that its mostly possible that there was a Syrian Merchantman on the ship. The variety of the different weights on the ship showed that the ship was allowed to trade between Egypt, Syria, Palestine, Cyprus, troya, Hitit and Greece. All the evidence shows that the ship was a Finike trade ship coming from a Syria-Palestine harbour carrying a Syrian Merchant. This final decision have changed the wrong idea that was suggesting that the Finike people couldn't break the Greks sea trading legacy.